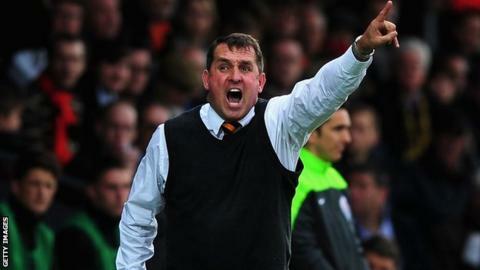 Barnet head coach Martin Allen has signed a new rolling contract after guiding the Bees to promotion to the Football League. The 49-year-old, who is in his fourth spell in charge of the north London club, saw his side clinch the title on the final day of the Conference season. "I am excited to be taking this group of players onto the challenge of the next level," he told the club website. "I am here for the challenge and to create history." He added: "I am sure everybody knows that I am not interested in fighting relegation or being mid-table. Summer recruitment will be key." Allen has announced his retained list for next season, and the former Gillingham boss has decided to release winger Lee Cook and centre-back Jack Saville. New deals will be offered to Michael Gash, Sam Togwell and David Stephens while Allen is set for further negotiations with Sam Cowler, Charlie MacDonald and Jon Nurse. The Bees have also taken up options to extend the contracts of Luke Gambin, Elliott Johnson, Bondz N'Gala, Luisma Villa, Curtis Weston and Andy Yiadom.